Many actors paid tribute to him, including David Arquette, Johnny Depp, Adrienne Barbeau, Angela Bassett, Courteney Cox, Scott Foley, Sarah Michelle Gellar, Kadeem Hardison, Jamie Kennedy, Heather Langenkamp, Rose McGowan, Cillian Murphy, Mitch Pileggi, Kristy Swanson and Amanda Wyss. Depp stated, "Wes Craven was the guy who gave me my start, from my perspective, for almost no reason in particular. I read scenes with his daughter when I auditioned for the part. At the time, I was a musician. I wasn't really acting. It was not anything very near to my brain or my heart, which is pretty much how it remains to this day. But Wes Craven was brave enough to give me the gig based on his daughter's opinion, I guess she had read with a bunch of actors, and after the casting sessions, she said, 'No, that's the guy.' I always think of her for putting me in this mess, and certainly Wes Craven for being very brave to give me this gig. But he was a good man — so rest in peace, old Wes." 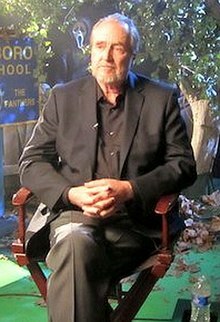 Robert Englund, one of Craven's most frequent acting collaborators said Craven was "a brilliant, kind, gentle and very funny man." Neve Campbell, who starred in Scream's franchise, said, "We lost a great deal of magic yesterday. I'm devastated to hear of Wes's passing. My life wouldn't be what it is without him. I will be forever grateful for his brilliant direction, his wicked sense of humour and his consummate kindness and friendship. He has entertained us all for decades and inspired so many to follow in his path. I loved Wes dearly and will miss him always. Thank you Wes!!!". ^ a b Tobias, Scott. "Wes Craven". Avclub. Retrieved January 25, 2018. ^ a b c Stratford, Jennifer Juniper. "WES CRAVEN: ONE LAST SCREAM". The Front. Retrieved January 25, 2018. ^ "Wes Craven: Film By Film". Empire Magazine. September 17, 2015. Retrieved September 17, 2015. ^ "THE SATURN AWARDS". Academy of Science Fiction, Fantasy and Horror Films. Retrieved August 31, 2015. ^ "Wes Craven - Celebrity Atheist List". Celebatheists.com. March 17, 2011. Retrieved September 13, 2018. ^ a b Ramin Setoodeh (September 15, 2015). "Johnny Depp Pays Tribute to Wes Craven, Talks 'Blass Mass' – Variety". Variety.com. Retrieved September 13, 2018. ^ a b By JonathanBarkan (August 31, 2015). "Robert Englund, James Wan, and More Mourn Wes Craven". Bloody-disgusting.com. Retrieved September 13, 2018. ^ a b Ben Child. "Wes Craven: Hollywood pays tribute to horror maestro | Film". The Guardian. Retrieved September 13, 2018. ^ Matt Edwards. "Cillian Murphy and Tom Holland Interview: In The Heart Of The Sea". Den of Geek. Retrieved September 13, 2018. This page is based on the Wikipedia article Wes Craven; it is used under the Creative Commons Attribution-ShareAlike 3.0 Unported License (CC-BY-SA). You may redistribute it, verbatim or modified, providing that you comply with the terms of the CC-BY-SA.